Hugging Chihuahuas | MWAH! S&P Shakers Figurines | One Price Low Flat Shipping! From Westland Giftware's Mwah! Magnetic Salt and Pepper Shakers Collection, Hugging Chihuahuas Shaker Set. Made of ceramic with glossy finish. Measures4" tall. Hand wash only. Packaged in decorative windowed gift box. 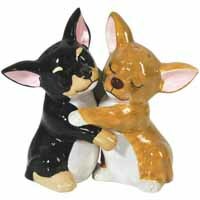 This shaker set is of a black and tan chihuahua dog hugging his blonde and white sweetheart. They are held together by a magnet. Great gift for the Chihuahua lover in your life!